The British Colonist of July 7, 1875 reported that the plans for the new Colonial Hotel, designed by John Teague, had been released to reporters. The article outlined the lavish appearance of the new building which was to replace the old wood structure that had recently been destroyed by fire on June 7, 1875. Along with a corner entrance for the hotel, the streetscape also featured storefronts. One of the first to occupy was the San Francisco Baths. This new building is a good example of Italianate commercial architecture and is a visual landmark, even in modern Victoria. By 1892, the B. C. Cattle Co. had its meat outlet here, and by 1902, it was the home of the Victoria Printing & Publishing Company, Barber Bros. Novelties, and B. C. Candy Kitchen. In 1907, when the streetcar made it way past the building, it was occupied by Victoria Printing and Publishing Co., Anton Zarelli – bootblack, and the British Columbia Market Co. Ltd. For many years in the 20th century, it was the home of the Poodle Dog Restaurant which had moved down the street from 615 Yates. 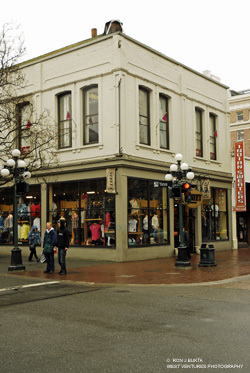 Today, the building houses a retail clothing outlet and a small restaurant.